A remarkable memoir, organized as a glossary of terms, that is part detective story, investigating a mother’s mental illness. 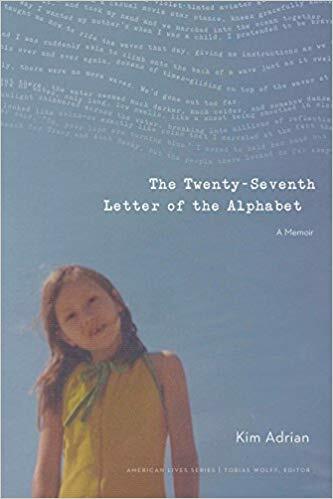 The Twenty-Seventh Letter of the Alphabet is a memoir with an unusual structure to match its ever-shifting reality. “I’ve wanted to tell this story for as long as I can remember wanting anything at all,” writes Kim Adrian (Sock): the story of her mentally ill mother, how she got this way and what Adrian can or should do about it. Linda, Adrian’s mother, has been diagnosed with a long list of ailments: borderline and narcissistic personality disorders, bipolar, psychosis, paranoia and more. Adrian’s father is an alcoholic; his memories, his assertions that Linda wasn’t always this crazy, “not like she is now,” can’t be trusted, because “he’d been drunk the whole time.” Adrian’s sister has few memories from their childhood. In constructing this narrative, then, she relies entirely on her own memory. But the trouble with remembering the truth of what happened is that Linda’s lies, manipulations and her own troubles with reality created a wildly shifting experience for her oldest daughter. If Linda retold a story, the very truth of it changed for Adrian. Reconstructing the past now is therefore a fraught undertaking. This troubled and troubling attempt to reorganize a life is organized alphabetically, beginning with an anecdote titled “Abecedarian” about an unexplained event in grade school, and ending not with “Zigzag” (Linda weaving down a city sidewalk), but with the entries under “&.” “Until the mid-nineteenth century, the ampersand was considered the twenty-seventh letter of the alphabet,” and for Adrian it offers inclusivity, “a verbal umbrella” under which she is both mother and daughter, both happy and sad. This structure, the glossary, would feel contrived or awkward in less capable hands. The narrative of Adrian’s childhood through her own motherhood and healthy, loving family life is told more-or-less chronologically, but in fragments, whose alphabetized titles emphasize the narrator’s reliance on words, on the power of storytelling to restructure her experiences, perhaps to fix something. The glossary’s entries are anecdotes, descriptions of family photographs or simple definitions. “Domesticity: A kind of faith, in my experience.” Deceptively simple fragments add up to more than the sum of their parts. The Twenty-Seventh Letter of the Alphabet is a feat on many levels. Adrian tells a harrowing story, surprisingly redeemed by her own sweet family, but in many ways also continuing. She gives it meaning without having answers to all the questions she still asks herself. Her work as glossator is astonishing and inventive. Her glossary is strangely gripping, with a momentum pulling the reader in and through. The result is whimsical, even darkly funny at times, brimming with compassion, terribly sad and deeply loving. Memoir readers should not miss this singular offering. This review originally ran in the September 7, 2018 issue of Shelf Awareness for the Book Trade. To subscribe, click here.